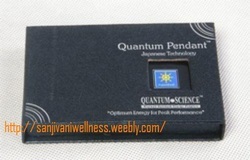 Quantum Energy Pendant - For those who prefer complete wellness without any supplements!! Scalar Energy proposes getting energy from nothing - energy from vacuum. It is also called zero point energy. Scalar energy was discovered in the 19th century (theory and practical); however its uses towards the human body have only come to existence over the past few years. Scalar energy not only protects the body from the effect of harmful radiation, but it also enhances the body's energy level of each cell, bio electric field and may stop the spread of harmful diseases like cancer. WHAT IS A SCALAR ENERGY PENDANT? Scalar Energy Pendant is one of the revolutionary product in health and wellness industry. This is now the hottest product in the world as far as wellness accessory is concern. Why? Because since scalar energy pendant was introduced into the market 4 years ago, there was a tremendous effect into the bodies of those who used it. Testimonials are growing significantly. Each user has their own respective testimonies to tell. We combine in the mixture the deep-sea volcanic rocks only found in Japan and emits more scalar energy than any Quantum Pendant in the industry guaranteed. Scalar Energy Pendant™ emits natural scalar energy because of the minerals inside it like germanium and tourmaline, etc. Germanium is a very popular mineral stone commonly and widely used as therapy for cancer patients. It improves blood circulation and promotes natural healing. It contains tourmaline, a very powerful stone that have negative (-) ions. This Quantum Energy Pendant emits scalar energy including the essential K40 resonance that promotes positive flow of energy & helps to maintain energy balance. You can get the same energy level of 2500 negative ions naturally in nature by going to water falls or caves. 2500 negative ions can only emit scalar energy that can penetrate up to 2″ deep in our body. Where as 3000-4000 negative ions can go as far as 4″ & energizes water & food faster. Our pendants have been tested to give off 3500-4000 negative ions! SCALAR ENERGY PENDANT IMPROVING CIRCULATION & BALANCING THE BODY'S BIO-ENERGY FIELD BY 3 IN 1 TECHNOLOGY. Some toxic gases, including carbon dioxide, or heavy metals like mercury and chlorine are easily trapped in large water clusters in the body. FIR causes the water molecules to vibrate, resulting in the breakdown of their cluster size. Consequently, trapped toxic waste gases and other toxic materials are released, and ultimately flushed out of the body. Together with the improved circulation, reduced water cluster size in the body wil result in improve cellular function, better energy and vitality. For people who suffer from aches and pains, FIR offers the welcome relief of improved flexibility and mobility , and the disappearance of pain and stiffness. Since 1858, in Lourdes, a small town in south-western France, many purportedly found that their pain, aches and illnesses miraculously disappeared after dipping into a spring, now known as the famous "Holy Spring of Lourdes". Scientist later attributed the spring's healing properties to its high content of Germanium. standing next to a Waterfall! * For best results, wear the pendant around your neck at least 8 hours a day for a minimum of 4 consecutive days. It is important to drink at least 8 glasses of healthful water daily when wearing the pendant (drink preferably energizing water.). Place it directly on the affected body parts (e. G. Knee, back, shoulder, ankle, etc. ) to relieve stiffness or soreness. Place it over the abdomen for stomachache and period pain Quantum Pendant turns the water in your body into healthy, energized, small-clustered water! Quantum Pendant does more than just break down the water molecules and energizing your drinking water. When you wear it, it keeps the water in your body grouped into small cell-penetrating clusters. These tiny clusters of water easily pass through cell membranes, carrying nutrients & oxygen into our cells, and waste & toxins out. This easy passage of water into and out of our cells is what keeps the cells clean, young and healthy. Volcanic Lava Stone/Pendant For Energy Healing & Water Energising. ENERGIZING WATER: Place the pendant or the Authenticity Card underneath a glass or a bottle of water container to energize the water (at least 20 minutes for every 500ml of water). Energized water can be used for drinking, washing, bathing or for watering the plants. * Although it is not typical, some individuals may experience some initial discomfort (head heaviness,light dizziness,etc.). If this happens, remove the pendant and try wearing it only for a few minutes a day, gradually extending your wear-time over a couple of days/weeks. Alternatively,you can try placing the pendant in a pocket below your waist. After a few weeks, you may then attempt to wear the pendant around your neck. * Because it tends to increase alertness and energy levels, some people may have a hard time falling asleep while wearing the pendant.If this happens to you, try removing the pendant 4-5 hours before bedtime. * if you feel that the pendant has some what "lost" its efficacy after wearing it for an extended period of time, remove the pendant. Wear it again after a week to enjoy its benefits again. You can also use the Scalar Energy Pendant to energize food (raw or cooked) personal beauty applications (lotions, moisturizers, hair growth products, shampoos), prolong the shelf life of flowers and plants, fruits and vegetables or energize your pets. Place the Pendant at each of the four corners of your bed to create an energy field. This energy field can help to energize you while you sleep. You'll sleep better and wake up feeling fresher. Place the Pendant underneath your skin care bottles to improve their absorption and efficacy. It helps to break down the molecules of the ingredients for better absorption. Give this to older friends and relatives. The elderly enjoy better balance and stability when they wear the Pendant. Test shows that after wearing the Pendant, you are better able to balance yourself. Shut your eyes and place the Pendant over your eyes to alleviate eye puffiness and discomfort. The Pendant can improve metabolism and blood circulation, thus relieving eye puffiness and discomfort. The sky is literally the limit with a Quantum Science Scalar Energy Pendant! This Scalar Energy Pendant provides Peak Physical Performance and as a result are in high demand by many World Class Athletes, International Sport Figures, Stars and Superstars – many of whom own several scalar energy pendant and scalar energy products! Treats Many Ailments and Illnesses The Pendant can treat many ailments and illnesses! Amazing testimonies in USA and recently in Malaysia , Singapore and India! The Scalar Energy Pendant WILL Change your Life! EMFs are all around us! The only thing you can do is try to protect yourself from them! A Scalar Energy Pendant does this VERY well! On the LEFT: Live Blood Cell Tests have shown reduced blood cell stickiness in as little as 20 minutes! This displays improved circulation and immune system functionality! On the Right: The Scalar Pendant calms the mind by balancing it to the frequency of the earth. 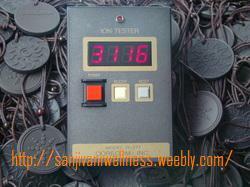 Below are a series of Tests some of which I performed using the Scalar Energy Pendant. These tests can display the immediate Strength, Balance and Flexibility Improvements Provided by a Scalar Energy Pendant ! Keep in mind these effects are accumulative as your body continues to benefit from the pendant! Repeat with liquor, soy sauce, salt, and cigarettes! You'd be amazed that they taste or smell different. Place one ice cube on top of Quantum Scalar Energy Pendant and another on a plate. Note that the ice cube on top of Scalar Energy Pendant will melt faster than the one left on a plate. This shows that the energy in the pendant is able to activate the molecules in the ice causing the ice to melt faster even when the temperature of the pendant remains cold. We challenge you to repeat this test with other energy pendants! The Scalar Energy Pendant Can Help! The Scalar Energy Pendant can relieve these “common” problems effectively! Many have tried and it works for them! Scalar Energy is now used to treat even HIV positive patients! Prevention Better than Cure! Even if you are in excellent health and do not seem to need the pendant, PREVENTION IS BETTER THAN CURE! Use the Pendant for Prevention! Well Known Personalities Using Pendant! Many more testimonials! Many well known sports personalities around the world in golfing, bowling, tennis, badminton, body building, etc. using the Scalar Energy Pendant. Even the famous Anthony Robbins uses it! We Must Resonate with Health Your body is a complex and highly sophisticated organism. It needs constant fine-tuning in stress-filled environments. At your best you resonate with health--almost literally, every part of your being vibrates in harmony. Conversely when your resonances are disturbed or interrupted, your body begins to break down. You become vulnerable to a variety of ailments and diseases. Not only are you not functioning effectively, but also your defense mechanisms are in decline. Regulate Body’s Homeostasis In biological terms, the Scalar Energy Pendant restores your body’s harmonies by helping to regulate the 'homeostasis' of your body. 'Homeostasis' is the condition of equilibrium, the 'dynamic range or balance' where your body's multiple systems operate together and resonate at their optimum. Scientific Reports The scalar energy pendant is based on strong scientific principles and evidence. The Barron Report, one of many, describes what scalar energy is and how amazing it is. There are many other scientific reports supporting the benefits of scalar energy for our health. Recently it is being used to treat HIV Positive patients! Scalar Energy, the Discovery of All Time! Many More Scientific Reports The greatest discovery of all time that will revolutionize medical science, treatment and health care Several scientific reports on scalar energy Most significantly is the positive effect on health. Humanity can expect more discoveries in the near future using scalar energy! Invest Wisely in Your Health! Small Investment for Your Personal Health, Great Returns! A one-time wise investment There is no need to charge the pendant as its energy is already imbedded into it, and will last perpetually! Do Not Delay! 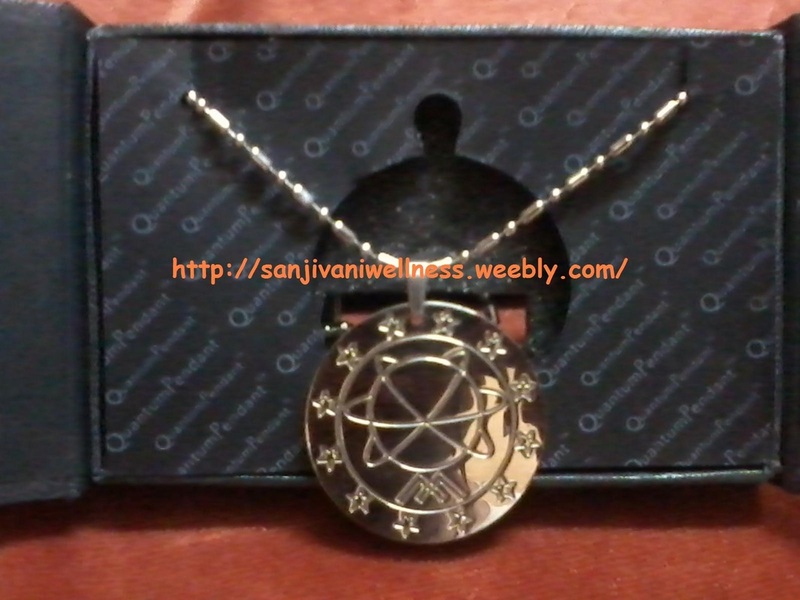 Put On the Scalar Energy Pendant Today and Start to Enjoy Excellent Health Immediately! Give your pendant a salt water bath before using for the first time. (ii) Kirlian photography, which captures the level of energy in objects, shows objects that are exposed to scalar energy to have higher levels of energy. 11. I am feeling uncomfortable the first few days after putting on the pendant. 12. Why do some people experience an initial worsening of the pain on wearing the Pendant? A.This is known as the 'healing crisis' which may occur prior to resolution of the symptoms. 13. What is the purpose of having the Authenticity Card? A. The number on the card should tally with the number on the Quantum Pendant™. The Authenticity Card has also been specially coated to provide similar effects of the Quantum Pendant™. 14. Unlike my friends who felt great after using the Quantum Scalar Energy Pendant, I felt a little dizzy when I first started wearing it. Is this normal? 15. Initially I felt great but the beneficial effects have somehow worn off after wearing the SE Pendant for a few months. Why is this so? What do I do? 16. Should I stop using the Quantum Scalar Energy Pendant once my health has improved? 17. Does wearing two Scalar Energy Pendants give me better and faster results? 18. My Quantum Scalar Energy Pendant broke, will it loses its power? 19. How do I energize the water? A. 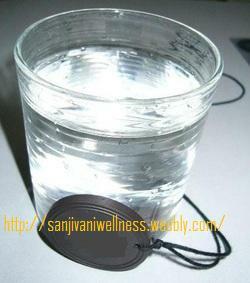 By placing Scalar-Pendant or the Authenticity Card underneath a glass or a bottle of water for at least 15 minutes. 20. How long will the water stay energized? A. Indefinitely, as long as the energized water is not exposed to electro-magnetic frequencies (EMF) or negative energy. 21. What are the benefits of drinking energized water? A.It is the same as the benefits of wearing the Scalar-Pendant and the effects last 4-24 hours depending on the individual's energy level. The water has a fresher and more pleasant taste. Some have applied the energized water to the skin for chronic skin diseases. Others have used it on their hair to promote hair growth. 22. What other liquid can I energize? 23. What is the difference between alkaline water and energized Scalar-Pendant water? A. Many have mistakenly believed that making the body less acidic via alkaline water is healthy! This can cause pH imbalance, bone problems and organ damage if not careful. Safest way is fruits and vegetables and your body balances the pH itself through natural processing of these healthy foods. Drinking water is safer when neutral pH, as it is in its natural state. For more information, read Harvey Diamond's "Fit for Life" book. Scalar Pendant does not tamper with the natural safe pH of energized healing water. If nature wanted us to drink alkaline water, then water would be alkaline. Keep in mind that water is of neutral pH. 24. Where is the proof of these benefits? 25. Where is the proof of these benefits? 26. How does it prevent jet lags? 27. How is it used to lock the chlorinated water? A. While chlorine is a wonderful bio-side, it has also been shown to destroy life. Fish and plants cannot live with it. If your supply of water contains chlorine then one can simply stand a bottle of chlorinated water over the pendant or authenticity card. The new molecular structure of the water will remove the smell taste and odor of chlorine. Yet the chlorine is still effective but in this case the fish can live and plants will grow. 28. How does the energy transfer to the water using Scalar-Pendant? A. The pendant energy resonates into the liquid where it ‘picks up’ the resonance. The resonance generated is similar to that which is found in the earth surrounding many healing spring waters of the world. Much research is now focused on this fact as 70% of our bodies are made of water and it is important to nourish the body with the correct molecular structured water. 29. Is the pendant magnetic? An experiment was conducted on electric ions and the permeability of the cell membrane. In the experiment, skin was used to exemplify the cell membrane. When positively charged ions were permeated into the surface of the skin, its pores and sweat glands began to contract. However, when Negative Electric Ions were permeated into the surface of the skin, its pores and sweat glands expanded, which demonstrates good metabolism of the cell membranes. This is phenomenon is called Prototype Plasma Membranes of Dermal Reflectivity. Dr. Arudoman of Germany also conducted a research regarding the influence of ions to the human body. He proposed the following hypothesis - Negatively Charged Ions are beneficial to the human body in four major ways:It helps to strengthen the functions of autonomic nerves, reinforces collagen (tissues that are resilient and tension-related), improves the permeability of the cell's prototype plasma membranes (improves metabolism), and strengthens the body's immune system. by Monumental Message. Under "Health Tips: Healthy Breathing & Negative Ions"
Negative ions have a number of beneficial effects on the respiratory system. Negative ions may decrease the severity of depressive symptoms (including the reverse neurovegetative symptoms of hypersomnia, hyperphagia, and fatigability) Treatment of seasonal affective disorder with a high-output negative ions" from The Good Drug Guide. Dr. Robert O. Becker, pioneering researcher and author of the book, The Body Electric and Cross Currents, has established that energy system within our bodies consists of two forces, magnetism and electricity, with the electricity component consisting of low-frequency direct-current (DC) electric field. This electromagnetic energy system is affected by the earth's natural electromagnetic environment, which is normally relatively quiet, with minor rhythmic variations, but which experiences great increase in a electromagnetic charged environment. A 1976 study featured in this publication provided evidence that negative ions can have a biologically lethal effect on airborne micro organisms. In 1950, Dr. Haskell applied Negatively Charged Ions to patients of Hypertension. Amazingly, Negative Ions were proven to have a positive effect in lowering one's blood pressure, while no beneficial effects were observed with Positive Ions. Negative Ions are also effective against influenza, asthma and especially bronchial disease. Another study done by the University of Frankfurt involved a "Cancer Team" in order to further study the physical effects of Negative Ions to cancer cells. Different types of cancer cells were transfused into the bodies of mice. In order to have a base of comparison, one group of mice were put into a negative ion environment each day while the other group remained untouched. As a result, the mice in the negative ion environment lived, on average, for 59 days, while the mice that were untreated lived no longer than 34 days. The mice from the experimental team lived 25 days longer; some even lived as long as 80 days! The experiment's result confirm the effectiveness of Negative Ions in treating cancer. Negative ions For Alternative Ideals In Health, Science, & Medicine. In addition, negative ions produce an INCREASE in the secretory performance of the mucosa with an INCREASE in cilliary movement in the airways. If you work with herbs, tinctures, aroma therapy, aurasoma, minerals, etcetera, use the pendant to enhance the energy and modify the physical structure. In most cases the effect will be 100% stronger than before. - Enter your body faster and work better than comparable un-enhanced products. - Enhanced products work to charge every single cell of your body with health promoting scalar waves. - The more enhanced products you use and the more often you use them, the more profound the effect. The effect is cumulative.